WEST YELLOWSTONE, Mont. — It seems that with every passing day, humans find new ways to better protect themselves from danger. Overnight stays in the wilderness were the treacherous norm thousands of years ago, and now moonlit strolls in many natural habitats are a tourist luxury. Yellowstone National Park’s natural beauty is almost unsurpassed in North America. Everything from the canyons to the weather is pristine. Many, including myself, feel its like walking somewhere back in time. In that sense of historic connection with nature comes a deeper appreciation of its power. 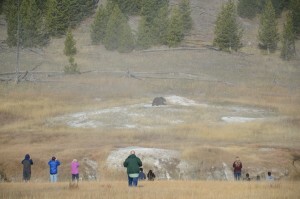 This is particularly true when visitors see Yellowstone’s large animals in their wild habitat. Click on the video to view an audio slideshow prepared by writer Marwan Alenezi about safety around wildlife in Yellowstone National Park. As beautiful as Yellowstone’s big mammals are, the reality is that they have the power (easily, I might add) to seriously hurt people. In the case of bears and wolves, this would seem very obvious. Unfortunately, bison, elk, and moose pose similar threats to people both in cars and on foot. In fact, they are arguably even more dangerous than their meat-eating counterparts because of how nonchalant some people are about interacting with them in the wild. The National Park Service spares no expense when it comes to raising awareness on the importance of staying safe with animals. 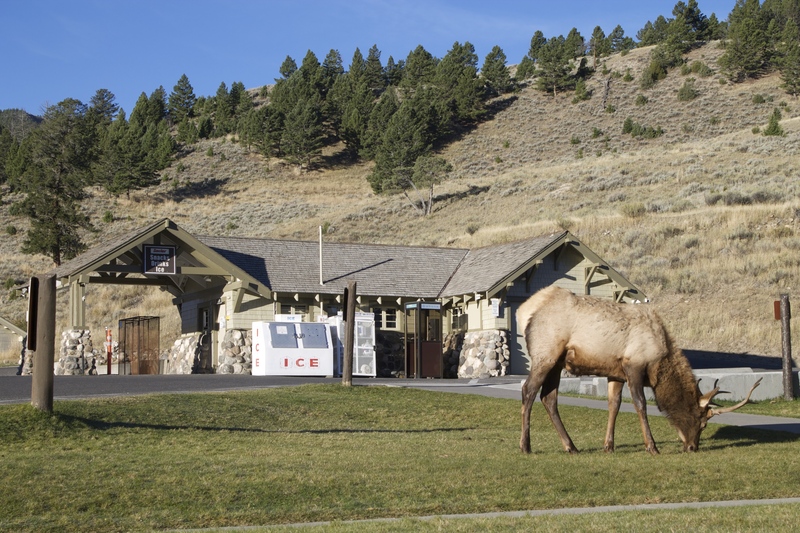 Yellowstone’s lodges, visitor center, websites, and even gift shops are all filled with reminders of the basic rules regarding animals. 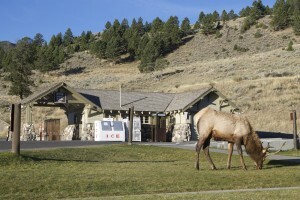 For the protection of the visitors, animals, and their relationship with each other over time, the park has general guidelines that must be followed whenever viewing animals. Every year brings a number of attacks, some of them fatal. To start off with a classic: Do not feed the animals! While this rule is found in zoos all over the world, it is of particular importance here in the park. Wild animals are almost always on the lookout for food. Natural selection has been a driving force that builds the physical and behavioral dimensions of an animal. A grizzly bear walks on a hazy Yellowstone hillside on the opposite side of a river from visitors taking photos. Once people begin to consistently feed animals, they may begin to associate people with food. This can generally bring them closer to visitors viewing from afar, increasing potentially unsafe interaction. This applies to both carnivores and herbivores. Since most animal viewing occurs when visitors are driving on the roads throughout the park, many of the safety rules and tips are vehicle related. We saw this quite a few times of the trip. A traffic jam in Yellowstone, unlike in Miami, is not caused by bad driving, lack of parking skills, or texting while behind the wheel. A long line of traffic in Yellowstone is usually a sign that a noteworthy animal has been sighted. In cases like these, the park advises visitors to park their vehicle in a turnout, making sure the car is completely off the road. The car should always be in park. Visitors should stay inside or near the vehicle, making it easier to retreat if an animal approaches, or worse, charges. 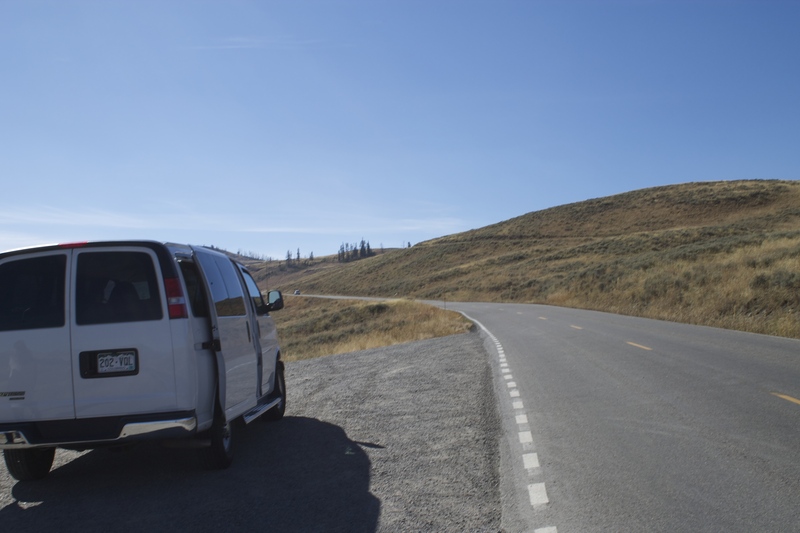 Our van parked on the side of the road for us to safely view wildlife in Hayden Valley at Yellowstone National Park (Photos by Marwin Alenezi). Many other rules apply when viewing wildlife in general. Yellowstone’s “Mammals in the park” pamphlet reminds readers to not crowd or follow animals, and to be cautious as to not block an animal’s line of travel. That could trigger an animal’s defensive behaviors. Sudden movements, or running in general, are also not advised. Finally, a rule that applies to arguably any living creature in existence, never get between an animal and its offspring. A mother’s love is a powerful natural force, and so are her horns, teeth, or talons. Since Yellowstone has been thoroughly studying its animals for decades now, and have a priority of keeping people safe, they have accumulated vast amounts of proven safe interaction tips and guidelines based on the specific animal in question. Off the top of people’s heads, it would make sense to think that the most dangerous animals are the two largest pure carnivores: cougars and wolves. This could not be further from the truth. Amy Bartlett, who has been at Yellowstone for 22 years, only recalled two cougar sightings over the span of her career. While cougars (also called pumas or mountain lions) are incredibly powerful ambush predators, the odds of seeing one, let alone being attacked, are incredibly slim in Montana, Wyoming, and Idaho. As docile as grazing elk are, these animals are still large and fast enough to seriously injure people with their antlers. Wolves, on the other hand, are frequently sighted (and even more frequently heard howling) in the park. Generally more elusive creatures than the herbivores or even bears, few people come into close contact with wolves. The national park service rules state that people should stay 100 yards away from wolves and bears. The most important wildlife rules to follow are the ones pertaining to bears. This applies to both the black and grizzly bear, but the grizzly in particular. The rules are especially important to know because bears are incredibly dangerous and because there are quite a number of rules to remember, and not all of them are what a visitor might expect. Yellowstone’s serious development and enforcement of bear regulations began in the late 1960s. Before then, bears were more commonly sighted because hotels and campsites would have large, open dumpsters just outside their grounds. Bears were naturally attracted to them, and made a habit of showing up when the trash was taken out every night. Drivers and hotel guests would regularly peek out windows and see bears. In 1967, two men were killed by the same ‘dumpster bear’ in Montana’s Glacier National Park. That heinous incident has since been called the ‘night of the grizzly’, and the park began strictly enforcing hotel, picnic, and campsite dumping and littering rules. This also sparked an initiative to develop hiking and camping safety guidelines. Decades of research and experience later, Yellowstone now has vital information available for all visitors that all but guarantees safety while viewing these amazing creatures. Hikers, or anyone without a vehicle, can be safe by being alert and making noise when on foot in bear country. More importantly, visitors should never hike alone (rather, at least in groups of three) and always carry bear spray. The spray, sold in gift stores, visitor centers, and countless other places, contains capsaicin, which is the chemical that makes peppers hot. The park service states that the spray is “proven effective” and therefore considered a packing priority. For campers, the priority is food storage. The Grizzly and Wolf Center presents all the information needed for safe overnight stays in the wilderness. Food should be stored in bear proof-containers. What people don’t know is that coolers of all sizes, vehicles with even slightly open windows, and tents are not bear proof. Black and grizzly bears have been known to steal food from very hard to reach areas. All food should be sealed in bear proof containers and hung at least 10 feet high and four feet from each vertical support. 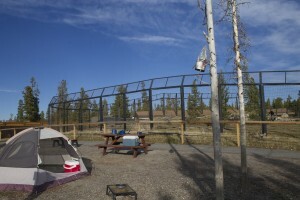 The tent should be pitched at least 100 yards from the foot storage and food preparation area (fireplace). Other than human food, pet food, and garbage, bears’ keen senses are also attracted to cooking oils, pots, stove and lantern fuel, beverage containers (open or closed), insect repellent, even toiletries and make up. 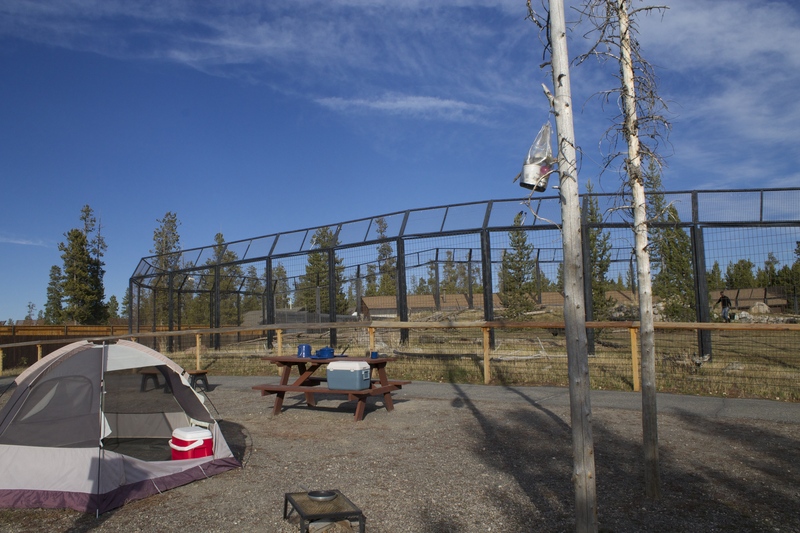 At the Discovery Center in West Yellowstone just outside the park, a campsite is filled with mistakes, with a sign that challenges visitors to guess what’s wrong about a site like this in bear country. Even when preventing bear attraction while alone or sleeping, Yellowstone reports that there are almost 1,300 bear sightings annually. In case some of those are too close for comfort, Yellowstone has devised a definitive list of what to do and never do. If you encounter a bear by surprise, slowly back away. Most bear attacks are defensive, especially with grizzlies, so if nothing happens, leaving the area in a nonthreatening manner is your best option. Sometimes, maybe when the bear has cubs or believes a person is in its territory, it will charge. What is vital to remember is to never run. Even a large grizzly has a lot more speed and stamina then most humans when sprinting. If you see a bear charging, stand our ground and use bear spray. This, of course, assumes that you will not panic and have thoroughly read the spray manual and know how to use it. This method will work most of the time for two reasons. The first is that the spray is proven effective. The second is that the charging bear might not have intentions to attack. Redfield described a defensive method found in many animals, herbivorous and carnivorous, called a bluff charge. This is when large animal charges toward a potential threat with the hope of intimidating it with its size and aggressive behavior, in the hopes that the animal would back off. In the unfortunate and rare event that a bear does charge and attack, play dead. Without running, drop face-down. If you have a backpack on, keep it on, as it might help protect your back and sides. It might seem counter-intuitive, but it is scientific fact that could save a life. I was initially skeptical, so I asked Bartlett if that was true or just an outdated piece of advice. She scoffed an assured me it was real. “A few years ago there was a married couple that encountered a bear without spray. They both panicked and ran for it. Luckily, the wife tripped,” she said. At this point, I looked around the conference room to see if anyone else had the same reaction to her last sentence. Bartlett said that there is, on average, one bear-related injury per year. In Yellowstone’s 144-year history, bears have killed eight people. The number of dangerous encounters has been dropping significantly since the 1960s. Redfield and Bartlett both gave us the same sobering fact about wildlife in the park. The animals with the most attacks and fatalities, by far, have been bison. In 2015 alone there have been five attacks by October. While bears maul their victims, bison gore them. The average number of annual fatalities by these grazing herbivores is two. They have also been known to attack cars, and in a few cases flipping them over. This is not to say bison are generally more dangerous than bears. But with too much of a laid back attitude toward them, visitors tend to get too close too fast. Rangers also believe that victims unknowingly block the bison’s line of travel as the head of the herd leads the large group. As with moose and elk, the rules states that people must be at least 25 yards away. These large animals are also fast and equally as protective of their offspring. Herd members have been known to protect other members’ offspring, too. These animals, luckily, also bluff a charge, giving even overly ambitious visitors a sign not to get too close. While all visitors dream of a face to face interaction with these magnificent creatures, the national park has a responsibility to protect its visitors. The general rules do not hinder awesome wildlife viewing, but rather makes it sustainable. The rules are there for people just as much as they are there for the animal populations. Safe and natural interaction even makes for better photographs, experiences, and conservation.